Holiday homes all the family, grandparents, parents and grand children too - it's all about the layout! Charming private manor house with private pool. This property has exceptionally beautiful views over the vineyards. A child-friendly cottage in a great location to explore Normandy, without having to bring all your toddler equipment. Child-friendly holiday cottage located in the historic Boyne Valley in Ireland just 30 minutes from Dublin and less than half an hour to beaches. This is a beautiful five star child-friendly house, located along the river with its own pretty gardens. It is the largest house within the grounds of this stunning family-friendly estate, Bruern Holiday Cottages, in the Cotswolds with lots of facilities for all the family. Wonderful child-friendly holiday apartment, only a 3 minute walk to beach, enclosed garden, use of swimming pool, tennis courts and play area. A large luxury holiday cottage, with fenced garden and private hot tub, set in the Suffolk countryside with access to indoor pool, farmyard friends and more. Unwind at this luxury family-friendly hotel in the heart of the New Forest, a fabulous location for a host of family activities, just one and a half hours drive from London. A wonderful toddler-friendly holiday cottage in Normandy, with enclosed swimming pool and integral play barn, this truly is the ideal toddler holiday location! Perfect for two families sharing as two bedrooms each on first and second floor. There is also a one bedroom cottage within the grounds, babysitting and catering service available too. This four bedroom private family-friendly villa, with swimming pool, in the heart of France in the beautiful region of Correze is ideal for a large family gathering or two families sharing. A fantastic holiday home half a mile from the beach and No:2 in ‘Best for families’ in the Sunday Times best cottages. This place is a real treat! A beautiful country house overlooking Shanklin Down in the Isle of Wight offering a lovely collection of child-friendly holiday apartments perfect for a couple and baby through to a special group celebration. There are four apartments in total and all guests have access to the facilities including large landscaped gardens, heated outdoor pool, play house, sauna, and fire pit. Walk to the old village or beach, both under 15 mins. Spacious country style house in North Cornwall (two miles from Bude), situated on a family-friendly farm stay with private garden and private hot tub. Luxury three bedroom holiday cottages in the Cotswolds, all of which are baby and toddler friendly with indoor swimming pool, gardens, play house, games room, spa, and lots of toys and gardens to explore. A luxury detached child-friendly villa in the Algarve offering amazing views of olive groves and distant mountains. Situated in a quiet rural residential area yet less than half an hour’s drive to the sandy beaches and fun-filled resorts. A lovely two storey holiday apartment with enclosed garden, 2 bathrooms, pool, 3 minute walk to beach. A perfect family holiday home. A beautiful 5 star rated holiday cottage set in acres of Suffolk countryside with private garden and hot tub. Families holidaying here have full access to all the facilities on the farm including an indoor swimming pool, games room, beauty room and more, the owners can also arrange babysitting for a night out. Located in 21 acres of grounds, this is a great gite for large families or groups of friends. Play barn, 2 swimming pools, ponies and more! Two three-bedroom holiday cottages, ideal for two families sharing or multigenerational holiday. Plenty for all ages here with enclosed swimming pool, gardens, play barn and animals to pet in the beautiful Lot region of South West France. Hill Crest is a beautiful family-friendly farmhouse in the Calvados, Normandy countryside. Boasting 3 acres of grounds, it is nestled away in lovely orchards on a no-through road with small pool, playroom etc and is 10 minutes from a sandy lakeside beach. Stunning child-friendly holiday home with heated swimming pool (with beach slope entry ideal for toddlers) near the picturesque village of Castlemoron on Lot. 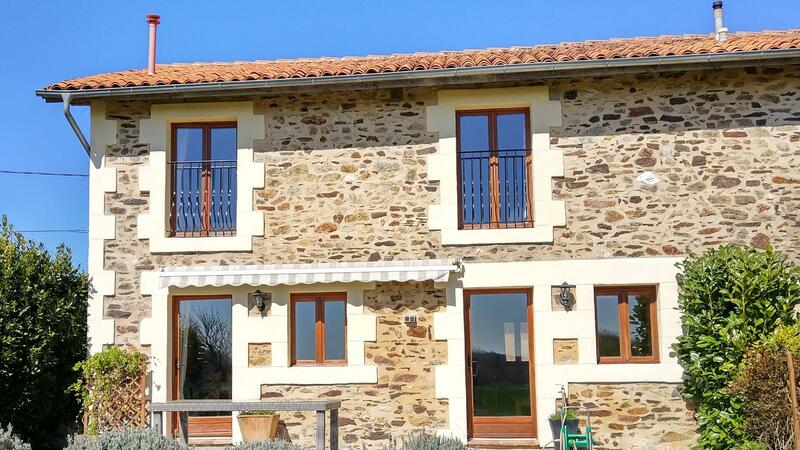 A large family friendly holiday home situated in a small village in the Vendee. 2 Acres of gardens, private swimming pool, ideal for family gatherings and groups of friends holidaying together. Luxurious & spacious secluded holiday home, sharing facilities with the neighbouring 5 lodges. This beautiful Georgian manor house family-hotel overlooks Chesil Beach in West Dorset with lots of activities for all the family. A fantastic opportunity to holiday with friends and family in these two beautiful cottages with exclusive use of grounds and heated swimming pool. This child-friendly holiday cottage is perfect for a group holiday or special occastion. There are two cottages here connected by an internal door, a one and two bed cottage and the private terraces can be opened up and used as one large terrace. All ages will enjoy it here, there are animals to feed, pony rides, plus riding for adults and clay pigeon shooting and much more to keep the whole family entertained including a private heated outdoor swimming pool and 10 acres of grounds and play areas too! This large super child-friendly house is a stone’s throw from the beautiful Tresaith Beach in West Wales. Awesome views and sightings of dolphins right from the garden! This lovely three-bedroom holiday cottage in St Ives, Cornwall is ideal for families looking for a break away from it all. Situated in an area of outstanding natural beauty and with its very own coastline this farm-stay is perfectly located for all the family activities Cornwall has to offer. Large child-friendly manor house located in a little village on the edge of the Dordogne in France, walk to bakery and bar-restaurant and 3 km to lake beach. Perfect for special occasions with friends and family on holiday, catering available too. Private garden and access to the shared enclosed swimming pool and facilities within the owner’s grounds. Wonderful family-friendly hotel and spa in Cornwall offering sea views, kids club, maze, swimming pool, splahs zone, pirate ship, sand pit, crazy golf, tennis, football, golf, croquet and more. Sands Resort Hotel and Spa has been owned by the Malcolm family for over 40 years, and they invite you to a family holiday adventure of exploration and relaxation by the sea in north Cornwall. This "Four star, Gold” child friendly luxury cottage is in an awesome location, walking distance to beach and village, perfect for your family break away. An oasis of calm and lots of child-friendly facilities can be found at Chateau de Gurat, located on the edge of a tranquil village, it is ideal for exploring rural france. This cottage is one of six and has its own private terrace. The ideal family-friendly house in the Vendée with superb facilities and equipment for babies and toddlers, close to amenities and the beach. The heated swimming pool and playroom are perfect for the little ones. A wonderful child-friendly holiday home and studio cottage in the beautiful Lot et Garonne in south west France. Possibly the perfect place for a family holiday with young children. Swimming pool is heated and enclosed, there are play areas and lots of toys for all ages and a fabulous outdoor entertaining space for the whole family. There is even a cosy cottage for 2 included, maybe for the grandparents. A fantastic holiday home ideal for two families sharing. Close to beaches and within walking distance to the local village. Great for exploring the Vendée and having a truly relaxing break away. Three bedroom family-friendly holiday cottage in this small family run finca in Andalucia, Spain set within a beautiful organically managed estate of five child-friendly holiday cottages with communal swimming pool. A choice of two 3-bedroom holiday gites in this lovely small family-friendly complex in the Charente Maritime, France. Each with two bathrooms so perfect for grandparents too. There are a total of six toddler-friendly holiday cottages sharing the facilities including enclosed heated swimming pool, kids club, toys, games and gardens. Each cottage has its own private garden area with BBQ. Lovely child-friendly holiday villa in Lanzarote with walled and gated terrace. This small gated complex of six villas has a shared solar-heated swimming pool. VIP airport transfer, bottle of cava, walk to beach, restaurants and sea views from master bedroom balcony! Luxury family holiday under canvas in the beautiful Lancashire countryside with private bathrooms too! An impressive 200 year old manor with huge rooms and a terrace overlooking the valley. With its private swimming pool, it's perfect for groups or large families. A fantastic family-friendly holiday cottage that will suit all ages. Perfect for group getaways and family get-togethers with play barn and pool. A large Charentes country house with a cute one bedroom lodge, perfect for a child-friendly holiday in the Charente- Maritime, France for up to two families with grandparents. There is an enclosed swimming pool, alarmed and gated and wonderful outdoor kitchen area. La Rochelle is just a 40 minute drive. White sandy beaches, clear blue seas and a car free zone. One of two 4 bedroom cottages on this truly spectacular island. This 7-bedroom family-friendly holiday home is ideal for a multigenerational holiday or large group holiday. It can be split into two separate holiday homes or one large (with annex). The gardens, private swimming pool and lovely location make it perfect for a special holiday with family and friends. Super child-friendly farmhouse which is just a 2 minute walk to the village of Angles and 10 mins by car to lovely blue flag beaches. There is a shared heated pool (with 2 other child friendly cottages) and lots of baby & children’s toys and equipment. Travel cots with cosy mattresses & bedding and high chairs are available for 5 babies making this a perfect choice for twins & multiples. Self-catering farmhouse near Bude with private garden and full use of facilities, including indoor swimming pool, games room and animals – village location just 2 ½ miles to sandy beaches. This is ideal for a larger family gathering. A beautiful family friendly holiday home, ideal for a group getaway or large family break away. With everything you could possibly need for your holiday with little ones. Spacious Grade ll listed holiday cottage in the pretty & historic village Kingsand in Cornwall and only a few meters to the beach. One of the UK's best coastal holiday cottages (The Sunday Times), awarded 5 star Gold by The AA and over 125 5 star reviews on Trip Advisor! Wonderful family-friendly holiday cottage in the New Forest, five minutes’ walk to shops, just a mile and half to the Hampshire coast, and also ideal for exploring the heath and forest. This child-friendly cottage is perfect for special family celebrations. This private child-friendly holiday home has an enclosed garden and is located in Milford-on-Sea, in the New Forest. It is within walking distance to the village and beach. The two bedrooms can be set as a twin or doubles and are large enough to accommodate two cots. The owners try to be as flexible as possilbe for families and also have a childs futon bed available. Two charming two storey holiday apartments, side by side, perfect for two families to holiday together, and just a 3 minute walk to beach! A fab large child-friendly house only 10 minutes from sandy beaches and short walk to village centre. The ideal place for a family holiday with young ones with lots of play equipment and great facilities for babies and toddlers. Two child-friendly holiday cottages in Sussex ideal for a multi-generational family holiday. The cottages can be used individually or as one holiday home with interconnecting doors. There is a on-site tea room open at certain times through the year and heated outdoor pool open May-September. South Downs National Park on the doorstep, beaches 10 minutes by car and lots of family-friendly attractions nearby. A stunning Grade II listed luxury cottage in peaceful and picturesque surroundings in Dorset. 25 minutes from beaches and lots of baby and toddler equipment. This four bedroom child-friendly holiday home at Chateau de Gurat is ideally suited for large families or 2 families sharing. Lots of facilities for all the family from home cooked meals, maid service and relaxation treatments. And plenty of kids facilities to keep them occupied. This wonderful family-friendly hotel is located just two hours from London in a beautiful estate in the heart of the Suffolk countryside with amazing facilities for families with babies, toddlers and young children. A beautiful child-friendly holiday cottage with an abundance of baby and toddler equipment, perfect for an indulgent family getaway. Walk to the local village deli and pub, Bredon Hill is on the door step too. Babysitting can be arranged as well as beauty treatments and if you want to venture out there are lots of famil-friendly attractions close by. Detached private child-friendly holiday villa in Lanzarote with gated heated swimming pool, children’s pool and hot tub with panoramic sea/mountain views. Quiet location 4 km to Puerto Calero. A beautifully spacious manor house in a lovely quiet French village with five bedrooms, private heated swimming pool, walled gated grounds, and lots of facilities for families with babies, toddlers and children of all ages. Newmarket is a family-friendly holiday cottage located on a beautiful estate in the Cotswolds with access to swimming pool, children’s play areas, lovely gardens, spa and more. Bruern Holiday Cottages offer five-star luxury holiday accommodation in a stunning setting. A truly amazing luxurious child-friendly villa overlooking the Silver Coast in Portugal. A dream holiday awaits every member of the family with private enclosed swimming pool and even its own crazy golf course! Lovely family-friendly holiday cottage in Pembrokeshire, Wales enjoying 22 acres of private gardens and woodland, four miles to Blue Flag sandy beaches, three miles to the stunning National Park coastline. There are four other child-friendly holiday cottages here too and the whole farm is eco-friendly, generating 85% of its own energy. The ideal location for a family holiday, walking distance to the village and only ten minutes in the car to blue flag sandy beaches. Shared pool with two other child friendly holiday cottages and lots of games and toys for the little ones. This small family hotel and resort is located in a charming village on the coast on the edge of greater Lisbon in Portugal. There are also a handful of villas here for a self-catering family holiday. Children will love the kids clubs, swimming pools and playgrounds and adults will love the spa, gym baby concierge and more. A beautifully renovated farm in Brittany offering child-friendly and accessible holiday accommodation. Heated and covered swimming pool, four acres of gardens with lots of games and toys for children of all ages, animals to pet and close to ports and airports too. Fun-filled quirky holiday home for all the family to enjoy in the New Forest, boasting heated swimming pool, two play rooms, one for big kids with table tennis etc and the other for babies and toddlers with tepee and toys and wonderful child-friendly biking trails straight from the house. This large child-friendly holiday cottage sits in a beautiful valley near Vejer, Costa de la Luz, Spain forming part of the finca El Sueno. It’s boasts a private infinity pool and stunning views- guests staying here have access to the shared facilities too. This is a luxury family holiday home with full catering options available. A lovely spacious modern home near Estepona, 10 minutes from the Marriotts Playa Beach. With an enclosed garden and shared swimming pool the kids will love this place. Only a short walk to the supermarkets, bars and restaurants too. Large four bedroom holiday apartment in the Isle of Wight, ideal for a family holiday with young children. Walk to towns and beach, enclosed swimming pool and gardens, babysitting, private hot tub and patio. A wonderful collection of luxury child-friendly cottages located just an hour and a half train ride from London Paddington and a short drive from London along the M40. Swimming pool, play areas. spa and more... Bruern Holiday Cottages offer self-catering holidays with a hotel twist. A beautiful manor house in Wiltshire offering luxury family hotel accommodation and 14 acres of grounds for toddlers and young children to explore. Looking for a baby, toddler friendly yoga retreat in a stunning and relaxing environment? Then look no further! As well as being able to rent the villa for a family holiday the owners of this wonderful holiday home offer all-inclusive yoga, cooking and family fitness holidays at certain times of the year. The lake and hill views are the perfect backdrop to a stress-free family holiday. Lots of cots, high-chairs, baby/toddler kit and space! So also perfect for families holidaying with twins or more. This luxury farmhouse at Treworgey Cottages is perfect for a multigenerational holiday, grand-parents can escape to the downstairs bedroom or choose one of the en-suite bedrooms on the first floor. The farmhouse is has it\'s own enclosed garden and shared the facilities with 14 other family-friendly holiday cottages. There are stunning views, an outdoor swimming pool, animals to look after and ponies to ride too! Located just a few miles from Looe in Cornwall it\'s a fab child-friendly farm stay in Cornwall, ideal for all the family. A beautiful four bedroom holiday cottage with amazing beach outlook on the Norfolk coast. This is truly a rare find and it is baby and toddler friendly! Beautiful family friendly cottage nestled in extensive grounds with three other properties, heated swimming pool and private and communal terraces and lots of gardens and meadows for the children to explore. One of two beautiful child-friendly cottages in stunning countryside. Swimming pool, lots of outdoor space and a lake beach only seven kms away. Fabulous five-star luxury beach hotel and resort in the Algarve, Portugal, in a stunning location with amazing sea views. Ideal for all of the family with a huge assortment of hotel rooms and self-catering accommodation, restaurants, spa, kids clubs and a wealth of activities for children and adults of all ages. Two family-friendly holiday cottages perfect for a holiday with friends or extended family, maybe grandparents. The cottages are adjacent to one another and both terraces overlook the play area. There is a total of five bedrooms and the cottages can accommodate up to 10 guests plus cots. Located in the beautiful area of southern Brittany on the Loire border, they are great holiday homes for a multigenerational holiday in France. A lovely toddler-friendly holiday cottage with annexe, perfect for 2 families or grandparents sharing. Lots of toys and games with playroom, enclosed swimming pool and dining options too at Le Chevrefeuille. Lovely stone farmhouse set in 52 acres of grounds with fantastic facilities for the kids to include pool, play barn, outdoor play area and games room. A wonderful vintage, eccentric, higgledy-piggledy thatched holiday retreat in the New Forest. Jump down the rabbit hole and head to a wonderland of fun – not for minimalists looking for sparkling luxury or glamour! Short bike ride/walk to beach 1km. Perfect for larger groups, families and also wheelchair friendly, this lovely family-friendly holiday home has uninterrupted views over rolling fields. There are three child-friendly holiday cottages at Gites en Tregor that can be rented together or individually. Just 15 minutes from sandy beaches this is a great location for a family holiday any time of year.